While a Pokemon game for the Nintendo Switch was announced all the way back in 2017, it wasn't until earlier this year that both Sword and Shield were revealed for the first time. In this guide compiling all the information we have on both games so far, we'll be going over the Pokemon Sword and Shield release date, all three of the Pokemon Sword and Shield starters like Grookey, and much more. When Does Pokemon Sword and Shield Release? Pokemon Sword and Pokemon Shield were finally revealed in a Nintendo Direct on February 27. You can see the full trailer for both Pokemon Sword and Pokemon Shield, just below. However, there was no exact Pokemon Sword and Shield release date revealed. The "late 2019" release window was reiterated for both titles. We already knew about the Pokemon game for the Nintendo Switch targeting a release in 2019. Back in 2018, Nintendo announced that the game had slipped from 2018, and would now be releasing in "late 2019." 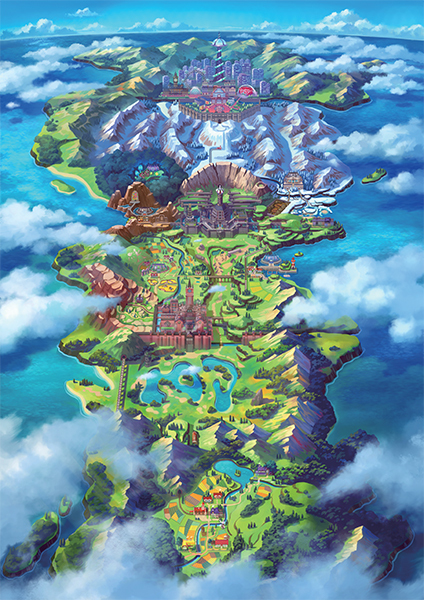 Also in the Nintendo Direct on February 27, the setting of the new Galar region for Pokemon Sword and Shield was finally revealed. As of right now, we've got very little information to go on for both titles, but the new region does look fairly industrial, as though the landscape is dominated by cities and factories. Does Pokemon Sword and Shield Have Random Encounters? The answer to this question is yes, Pokemon Sword and Shield does appear to have random encounters. In the reveal trailer for both games, we can see a player character walking into long grass, and getting attacked by a random Pokemon that appears out of nowhere. This is a big deal for Pokemon Sword and Shield, because both Pokemon Let's Go games last year dropped this feature. Both games removed the random encounters entirely, and in our humble opinion, the games were actually better off for it. Instead of randomly running into Pokemon in the open world, you'd see all the Pokemon patrolling the surrounding scenery, and decide which ones you wanted to engage in battle. So far, three starter Pokemon have been revealed for both Pokemon Sword, and Pokemon Shield. There's Grookey, the chimp Pokemon, Scorbunny, the fiery rabbit-looking creature, and Sobble, the timid water-type Pokemon. Doesn't this little guy just look adorable. Grookey is going to be the Grass-based starter for both Pokemon Sword and Shield. You can briefly see Scorbunny scampering around the environment in the Pokemon Sword and Shield debut trailer, leaving fiery footprints in the grass wherever they go. As you might have guessed, Scorbunny, is the Fire-type starter Pokemon for Pokemon Sword and Shield. Finally, there's Sobble, the timid looking Pokemon that will probably run away at the first sign of danger. In Pokemon Sword and Shield, Sobble will act as the Water-type starter Pokemon. And just as you might have predicted, shortly after the reveal of the new Gen 8 starters, Twitter was ablaze with the hot takes. It certainly seems like Grookey is the most popular starter Pokemon, and Sobble is unfortunately the one that everyone's making fun of. Poor Sobble. So what information could we glean from the debut trailer of Pokemon Sword and Pokemon Shield? Just below, we've recapped all the essential information that you need to know from the reveal trailer into concise points. Random encounters are back once again. Galar is a Britist-based land. Character customization features in Sword and Shield. There's a dynamic day and night cycle. Sword and Shield are directed by Pokemon Sun and Moon lead Shigeru Omori. These all are the collective rumors and information we have surrounding the Pokemon Switch project right now, but make sure to keep an eye on this guide, as we'll be updating it with all the future information that releases surrounding the game, particularly with E3 2018 on the horizon. Tagged with Adventure,	Family,	Guides,	Nintendo,	Role Playing Games,	Switch.